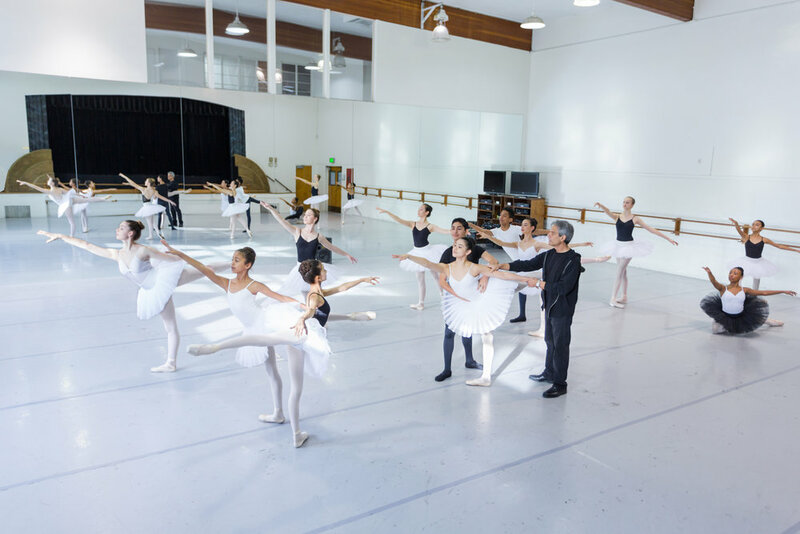 Anaheim Ballet School’s training methodology is based on the Russian, French, and Italian schools making what the Rosenbergs call, “truly the American method, the best of everything!” A strong kinetic methodology, heavily influenced by movement analyst Joanna Kneeland, is predominant in all classes drawing from the principles of physics and the belief that ballet is a natural system of movement. Classes are offered to all ages and training emphasizes developing strong technique, promoting a healthy lifestyle, inspiring artistry, building good character and instilling a sense of community and purpose through the arts. ABS offers ballet training for pre-professional students and while not all ABS students go on to professional performing careers, many do. Other students may carry on as dance educators, pursue backstage careers or venture into dance journalism. Regardless, all become informed and supportive dance audience members! Classes are focused on classical ballet, but ABS offers contemporary dance styles which are considered integral to a dancer’s full education. Students attend from one to fifteen classes per week, according to age, career, and health objectives. Private coaching is beneficial to help students over plateaus, develop variations for performance or competition, address individual concerns, and for additionally personalized instruction. AB School is a vendor with Compass Charter, Discovery of Learning, Epic Charter, Excel Academy, iLEAD Exploration, Inspire Charter, Sky Mountain Charter, Summit Academy, and Valiant Prep. Interested in ABS becoming a vendor for your student's charter school? Ask your school to send information to AB Administrator Ashley Duree at info@anaheimballet.org. Anaheim Ballet School is the official school of Anaheim Ballet, a 501C3 not for profit organization.